Search and rescue volunteers have located hundreds of people reported missing in the US south-east after Hurricane Michael tore through their Florida Panhandle communities, but the death toll of at least 18 was expected to rise. 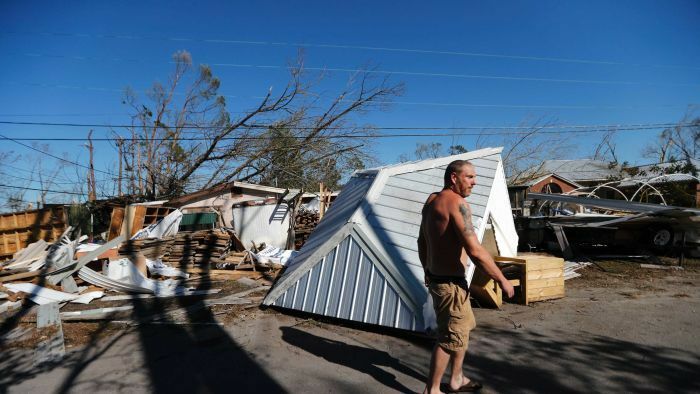 Crews heard cries for help and crowbarred into a mobile home crumpled by the storm in Panama City, freeing a mother and daughter, both diabetics who had been trapped in a closet without insulin for two days and were on the verge of diabetic shock. Taylor Fontenot, founder of volunteer search and rescue organisation 50 Star SAR, said many of the survivors they found were in a desperate situation. “We had another lady who was on her last tank of oxygen. No cell phone, no power, no nothing. There are people out here on dialysis, but there is no power,” he said. In door-to-door searches, teams consisting mostly of off-duty police officers and firefighters have found more than 520 of the 2,100 people reported missing since Michael crashed ashore near Mexico Beach as one of the most powerful storms in US history. Matthew Marchetti, co-founder of the Houston-based CrowdSource Rescue, said he expected that more and more people would be found as an influx of volunteers arrived and power was restored. “We expect that number to go up dramatically,” he said. But as roads were cleared to allow wider searches, the death toll was expected to mount. Authorities were reporting at least 18 deaths in Florida, Georgia, North Carolina and Virginia. Mr Fontenot, who said he alerts authorities when he finds corpses, has a cadaver dog with his group. Barbecued hamburgers and water were handed out in Callaway, Florida, an especially hard-hit town. She said it felt good to receive comfort, but it was also hard. “I lost everything so I got to start over,” he said near a tent in a parking lot where an insurance agent was taking claims. Mr Jackson said he plans to move to a community that was not so badly hit, but was concerned that delays processing his insurance claim might hold him up. The hurricane ripped most of two walls out from the red-brick St Andrew United Methodist Church in Panama City, but parishioners spent Saturday handing out food, water and clothes to others. Power and phone service were being slowly restored, with about 236,000 homes and businesses still without power in North Carolina, down from a peak of more than 600,000, said spokesman Keith Acree of the North Carolina Department of Public Safety.